Next Readathon Update #1 I’m still here! Woo hoo, good luck with the Readathon!!! Have a great day of reading! What does it spell? READ!! 30 books, my dear? 🙂 You rock. Hope today’s a great day! We have rain here in central IN, a beautiful day for reading. I hope you beautiful weather, too! I hope you have a great day of reading! Have fun today! I agree that it’s a good plan to have lots of books to choose from. I have 16 which is still quite a few! Hey, thanks for the message! 🙂 Good luck and happy reading to you too. I’m the same. If I had my way, I’d be a geography/economics/history/English major. So hard to pick just two let alone one! I’m not that ambitious but 3 books read would be nice. Happy reading!! Also I’ve noticed you changed your blog’s layout– it looks really swank. 😀 Love the colors! 6 books is an awesome goal! Good luck! I was an English major and am now (in my “old” age) finding my way back to many of the classics I read in college! Good Luck today & Happy Reading! I know I could never finish six real books during the readathon. I sneak in a few children’s picture books and graphic novels to get me through the difficult times. Yay! Shaun Tan! You are doing fantastic keep it up!! That book sound good; I’m adding it to my someday read books! Happy Reading! 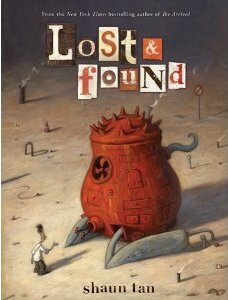 I’ve got some Shaun Tan to read, too. It’ll be my first time with him. I’m excited; so many people love his stuff! Good luck with this. I’m not really participating but I do want to try and get some good reading in today. I haven’t been reading much and miss it. Rah Rah Sis Boom Bah Show that book you’re readin’ who’s boss!